Background We describe the carrying out of our open door laminoplasty technique by reproducing a posterior vertebral arch using a local originating autologous bony graft and titanium plates. Methods We designed a prospective study and present our first 16 patients. The clinical results were evaluated with the JOA score, Nurick scale and the VAS. The functional and radiological evaluation was performed with radiographs, CT and MRI, and the measurements of the dimensions of the spinal canal were carried out with the MIPAV programme ( Johns Hopkins University). All the variables were statistically analysed by means of SPSS23.0. Results After following up the cases for two years, the clinical evaluation showed, amongst other findings, a 75% improvement in the JOA score, while the radiological controls showed an appropriate range of motion (ROM) along with the stability of the construction. The rate of complete arthrodesis of the cervical neo-arch reached was approximately 92%. Conclusions Our results show that the modifications that we performed on the technique originally described have made it into a simpler, more efficacious and safer procedure, without lessening its essential objectives. Cervical laminoplasty is a procedure that allows us to widen the diameter of the spinal canal and thus, decompressing the spinal cord and conserving some or all of the posterior elements of the bony cervical case. Oyama et al.1first described the technique in Japan in 1973. We present a modified version of the open-door laminoplasty initially described by Hirabayashi et al. in 1981,11 including the two-year clinical and radiological follow-up of the cases, along with a statistical analysis. Our aim is to increase the safety and effectiveness of this surgical strategy, but without losing sight of the objective of obtaining a sufficient widening of the canal, along with the best possible preservation of cervical movement. As observed in our literature review, our complete surgical technique has never been published before. Our team has carried out a prospective study of the first 16 patients with cervical multilevel compressive myelopathy submitted to a modified technique of the open-door laminoplasty, presenting the two- year follow-up. A total of 34 variables referring to the demographic and clinical characteristics of the patient, radiological characteristics of the vertebral process and peculiarities of the surgical technique were analyzed in each of the cases for the configuration of the data base. The information was obtained by means of a detailed revision of the clinical histories and imaging tests. All the surgical techniques were performed by the same surgeon, senior author ( JHV), using the same method. Under general anaesthesia, the patient is positioned on the surgical table in a prone position on small rolling cushions situated appropriately to alleviate the pressure on the chest. The head and neck are stabilized using a Mayfield skull clamp, the shoulders are taped down to obtain a complete radiographic visualization of the lower cervical spine and table is situated in reverse Trendelenburg approximately some 20 – 30 degrees to minimize the venous bleeding. Using intraoperative radiological control (C-Arm), the head is flexed to obtain a neutral alignment of the cervical column. For the vast majority of patients, the most severely compromised levels were between C3 and C6. After antisepsis and draping of the surgical field, a cutaneous incision was performed in medial line from the external occipital protuberance to the C7-T1, followed by subperiosteal dissection of the paraspinal musculature following medial raphe by means of monopolar electrocautery until reaching an adequate exposure, from the inferior edge of the laminas of the C2 to the inferior edge of the C7 laminas, of the spinous processess, laminas and articular processes, and always avoiding damaging the articular facets since this could cause unforeseen fusions. Once the exposure has finished, two retractors are placed, one at each end of the surgical wound. Next, the spinous processes from C3 to C6 (a total of four) are removed from their base by using a Still´s - Horsley bone cutter forceps or an oscillating saw, and are conserved for later use. The hemostasia in this step is assured with bone wax. Then, and to open the vertebral arches, we firstly create the “open side” of the laminoplasty. For this, a 2mm Kerrison punch is used to perform a laminotomy in the longitudinal axis along with the resection of the yellow ligament, in the union between the lamina and the articular processes. The small fragments of bone obtained during this manoeuvre are conserved in totality. In the same way, and to carry out the “hinged side” of the laminoplasty, a groove is made in the external cortical in the union between the laminas and the articular processes, using a 5mm diamond burr. This diameter facilitates, on the one hand, the posterior green stick fracture, and on the other hand, that the walls of the groove created do not collide when the laminas are elevated, and, consequently they do not limit the canal expansion. Special interest should be paid to this side of the laminoplasty during the drilling of the upper and lower edges of each lamina because they are the areas with the most concentration of cortical bone and that could make the elevation of the laminas difficult if the drilling is not enough. Lastly, a 2 mm Kerrison is used to section the yellow ligament transversally and in this way free the vertebral laminas that correspond with the upper and lower limits of the laminoplasty. In this way, and after the described manoeuvres, we have created three free edges and a hinged edge on those that articulate the widening of the canal. The opening of the laminas together as a single unit, is obtained by applying a Penfield dissector on the longitudinal free edge of the laminoplasty, whose extreme is situated in the medullar bone between the external and internal surface of the laminas, preventing with this manoeuvre the entrance of the distal extreme of the instrument accidentally in an already compressed spinal canal. Simultaneously to this manoeuvre, and using a Kotcher or similar instrument, we attach it to the base of the previously eliminated spinous processes in its longitudinal axis, and carry out a rotational movement on the hinged side, and hereby create a green stick fracture. It should be very careful during this manoeuvre so that the fracture is not complete, as well as not losing control of the laminas, which could slip, return to their original position and produce an added medullar damage. The control of the bleeding of the epidural vessels is made with bipolar coagulation and hemostatic material. With the aim of maintaining a sufficient sagittal diameter of the canal to achieve a radiological improvement (usually this is mentioned in the literature as a diameter > 14 mm 15, 16) we used the spinous processes of the patient, along with titanium plates and screws used, habitually, in maxillofacial surgery. Initially, each one of the spinous processes is carefully cut so that they acquire the appropriate shape and size so that, posteriorly, they can be fit with a certain degree of pressure in order to favour the fusion, in each one of the levels of the open side of the laminoplasty. In more detail, it is necessary to obtain from the spinous processses, bony grafts similar to struts or columns with the greatest proportion of noncortical bone in the extremes that will contact with the edges of the laminotomy regarding shape, and approximately 10-12 mm in length regarding size. Then, four straight titanium plates with six orifices and 2mm thick are used. Each one of them is molded like an italic “S”, always bearing in mind the size of the bony graft. The plates are generally situated: two orifices in contact with the articular processes, two orifices in contact with the laminas and the rest establishing the bridge between the articular masses and the laminas. Next, the cut bony struts are situated at the open side of the laminoplasty in contact with the both edges of the laminotomy, and are joined to the titanium plates with two non reabsorbable silk ligatures to finally assure the structure with two screws of 2.3 x 8mm in the articular masses, one or two screws of 2.3 x 6mm in the laminas and a screw of 2.3 x 4mm in the bony graft. Lastly, the small bony fragments coming from the creation of the free edge of the laminoplasty as well as the results of the cutting of the spinal apophysis, are triturated and positioned in the groove of the hinged side of the laminoplasty (Figure 1). (a) Stenosis of the spinal canal and compressed spinal cord. (b) Creation of open side, hinged side and extraction of spinous processes. (c) Insertion of bony graft cut as a strut or column in the open side of the laminoplasty (d) Stabilization of the construction with titanium plates and screws. Original drawings carried out by the senior author (JHV). After a meticulous hemostasia, the surgical incisions are closed following the anatomical planes with reabsorbable sutures of 0 in deep planes (muscle and nucal fascia), of 2/0 in superficial planes (adipose tissue and subcutaneous cellular tissue), staples in the skin and dressing. Drainage in the surgical bed was not used. In all the cases, the X-rays and CT scan were carried out at 24 hours after the surgery. If these studies ruled out any immediate postoperative complications, along with a satisfactory increase in the canal diameter and adequate placing of the plates, screws and bony grafts, the sitting position and posterior mobilization of the patient, with soft cervical orthosis in the first 3 months and rehabilitation after the withdrawal, were indicated. The clinical and radiological assessments were repeated at 3, 6, 12 and 24 months after the intervention. The radiological evaluation of the bony fusion and probable complications derived from the procedure was made with CT scan and MRI. The measurements of the dimensions and volumes of the canal were carried out with the MIPAV program ( Johns Hopkins University, Baltimore, Maryland, USA), employing thin slice CT scans. The postoperative cervical range of movement was evaluated with lateral extension and flexion radiographs. The statistical analysis was developed with SPSS 23.0 for Windows (SPSS Inc, Chicago, Illinois, USA). The evaluation of statistical difference in dependent variables was carried out with the Wilcoxon test. The results were considered statistically significant if p < 0.05. We analyzed a total of 16 patients submitted to a modified version of open-door laminoplasty in our department. The average age of the series was 62.3 years. The majority of the patients were in the 5th and 6th decades of life (62.5%; n = 10). The age range was between 37 and 80 years. Our series is composed of 14 (87.5%) men and 2 (12.5%) women with a ratio of 7:1. In terms of the disease presented by our patients, all the cases showed a preoperative JOA score 12, 13, 14 of ≤12 out of 17 total points (scores ≤12 are considered indicative of cervical spondylotic myelopathy), while the preoperative evaluation of independence for walking with the Nurick scale,15, 16 established a level of 3 (“extreme difficulty in walking that requires assistance and prevents full time employment and occupation”) on 8 occasions (50%), a level of 4 (“able to walk only with someone else´s help or with the aid of a Walker”) on 7 occasions (43.8), while in the remaining case (6.3%) the level was 5 (“Chairbound or bedridden”). The cervical pain with the visual analogic scale (VAS) of the pain,17 was established by all the patients preoperatively at a level of ≥6. There was a striking decrease in all the patients in the anterior-posterior diameter of the canal (< 12 mm), with the consequent surface reduction (178.14 ± 15.98mm2 for patient) and volume (1.61 ± 0.14 cc for patient) and, as a result, a more than notable medullary compromise. A total of 64 levels were intervened. The most frequently affected levels were C3, C4, C5 and C6 (75%; n= 12). At 24 months, the clinical evaluations showed a progressive neurological improvement, especially in the first 12 months, which was statistically significant: JOA score (Z= - 3.5; p< 0.05) and Nurick scale (Z= - 3.7; p< 0.05). Similarly, all the cases referred to a decrease in the cervical pain (Z= - 3.5; p< 0.05) (Table 1). Clinical evaluation and improvement at follow-up. One patient presented a transitory fifth cervical root motor palsy after surgery, on account of relevant adhesions, not properly separated, between dura and the inner surface of the laminae when the dorsal arches were lifted. At 24 months, the radiological evaluations showed the stability of the construction carried out with an anteroposterior diameter of the canal > 14 mm, in all the patients of our series. The complete arthrodesis of the cervical neo-arch was produced in 59 out of 64 (92.18%). The bony spinal canal dimensions at the intervened levels significantly increased up to 388.52 ± 11.68 mm2 for patient (Z=-3.5; p< 0.001) and 9.63 ± 0.29 cc for patient (Z=-3.5; p< 0.001). After two years of follow-up, we obtained a median decrease for patient of the ROM of 28.43 ± 6.14%. The interventions lasted 232.8 ± 15.2 minutes, with a blood loss of 95.1 ± 10.9 cc. None of the patients had to return to the operating theatre due to complications. We present an illustrative case: a 63-year-old man with cervical myelopathy due to multisegmental spondylitis. (Figure 2 & Figure 3). Preoperative T2-weighted MRI. 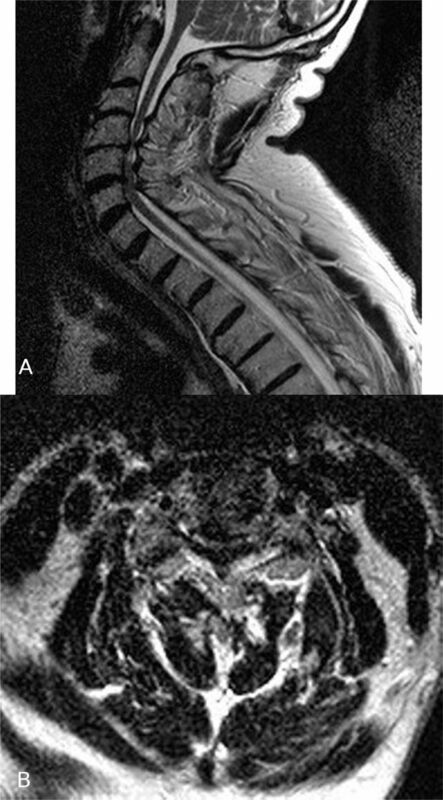 (a) Sagittal MRI that shows multiple discal involvements and a decrease in the diameter of the spinal canal (<12 mm). (b) Axial MRI at the C4-C5 level that illustrates the important compression of the spinal cord with an anterior posterior diameter of the canal of 2.60mm. Neuroimaging tests at 24 months after the surgical intervention (a), (b) Sagittal T2-weighted MRI and axial T2-weighted MRI (level C4-C5), that show an adequate spinal cord decompression with a medullary shift of > 3 mm. (c), (d) Sagittal CT scan (reconstruction) and axial CT scan (level C3-C4) where we can see a more physiological cervical curvature and the fusion of the cervical neo-arch. The cervical spinal cord can be decompressed using an anterior approach, a posterior approach or through a combined strategy. Most surgeons prefer the posterior approach if the involvement is at several levels (3 or more).20 The cervical laminoplasty was developed to overcome the disadvantages shown by the conventional laminectomy, with the objective of reaching an adequate decompression of the spinal medulla, and preserving the greatest physiological mobility possible of the cervical column. In 1981, Hirabayashi described the expansive single open door laminoplasty, consistent in the opening of the canal by means of the creation of a groove in the union between the lamina and the articular facets of one side, “open side”, a green stick fracture in the union between the lamina and the facets of the contralateral side, “hinged side”, and the elevation and attaching of the laminas “in block” from the open side over the hinged side.11 Nevertheless, this technique is attached to a phenomena of “spring back” by which the laminas could try to recover their original position due to, either a failure in the attachment system of the open side or a complete fracture of the laminas in the hinged side. As a consequence, this places the normal structures at risk. For this reason, diverse strategies have been described to maintain the spinal canal open. Our technique is a variation of the Hirabayashi method. In our opinion, the combination of spinous processes grafts such as bony spacers or struts, sustained by using molded titanium plates and screws, has great advantages. On the other hand, the attachment of the bony struts cut and fitted to the open side of the laminoplasty by means of titanium plates and screws conveniently molded and adapted at each level, configure a scaffolding that guarantees the stability of the construction until the fusion is produced, and avoids accidents such as the extrusion of the grafts, which could cause neurological damage and more than probable subsequent surgical revisions.21 In the same way, we consider that the use of two screws in at least one of the extremes of the plate situated on the free edge of the laminoplasty (preferably at the level of the articular processes), is an important contribution to the stability of the structure with the aim of avoiding possible movements from shear stress. In this way, with our construction at the open side of the laminoplasty and the positioning of bony fragments in the hinged side, we are able achieve an adequate decompression of the cervical spinal cord, as well as creating the appropriate setting to facilitate the fusion and obtain a solid cervical neo-arch. In recent years, diverse clinical studies have shown that the cervical laminoplasty obtains better clinical results than conventional laminectomy.25, 26, 27 If we concentrate on the laminoplasty technique described by Hirabayashi, the recovery rate shown in the diverse series published is approximately 60%,28, 29 in the JOA score. In our case, we obtained results congruent with the literature, observing an improvement of 75% in the JOA score at 24 months. Few studies have been published showing the longterm clinical results after submitting the patient to a laminoplasty. Miyazaki et al. observed that the neurological improvement was maintained for a median of 12 years after the intervention.30 In our patients, the neurological improvement is still lasting at 2 years of follow-up. Regarding radiological results, and more specifically those related to the increase of the diameter of the spinal canal after laminoplasty, various series have been published comparing the two main methodologies: “open door” vs. “French door” laminoplasty. 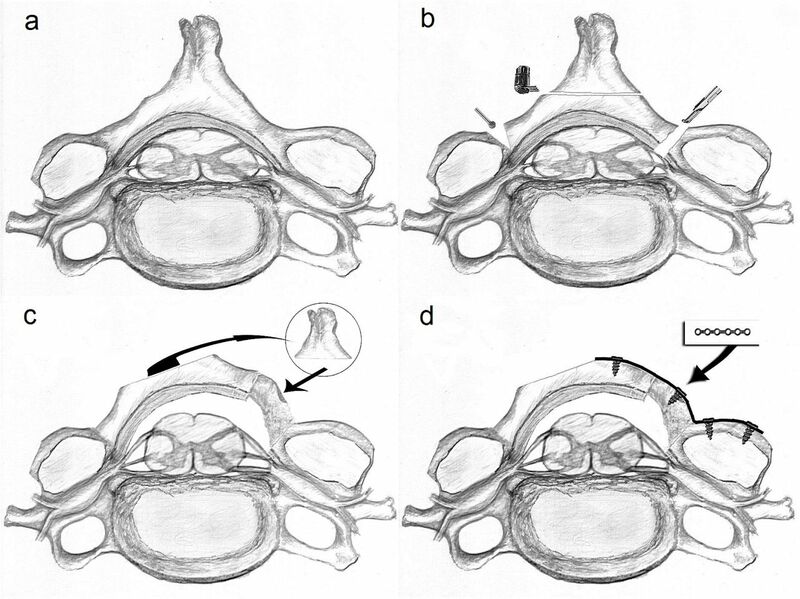 While in all of them, the results conclude that both techniques provide sufficient expansion of the anterior-posterior diameter of the cervical canal (>14 mm 15, 16) to allow the decompression and posterior migration of the spinal cord, the open door laminoplasty has the greatest rates of increase in the anteroposterior diameter of the canal 31, 32 and, consequently, the greatest increase of its surface. This finding were published by Parker’s group.33 They observed a greater increase of the surface in the open door laminoplasty from 204.3 mm2 to 331.7 mm2 compared with the French door laminoplasty, where the increase was from 201.2 mm2 to 280.8 mm2. In our cases, with the use of our methodology, we obtained a median increase level of the anteroposterior diameter of the canal of 16.98 ± 0.19 mm, a sufficient anteroposterior diameter to obtain benefits, which represented a median surface level of 97.13 mm2 and a volume of 2.40 cc. These figures are coherent with those shown in the literature. Cervical ROM has been reported to decrease 17-50% after laminoplasty with an average of approximately 50%.8We obtained a median decrease of 28% per patient. In our opinion, it is compulsory to perform a careful dissection, which always avoids damaging the articular facets and cause unforeseen fusions, in order to preserve the range of motion. With regards to the operative time and intraoperative blood loss, a systematic review of the literature (n=276 patients) showed that the operative time for laminoplasty procedures took an average of 137.4 minutes and the average blood loss was 299.6 cc.19 Our interventions lasted a median of four hours and we think that this is due to both the careful preparation of spinous processes and titanium plates, and the learning curve. On the other hand, our intraoperative blood loss for patient was lower than the figures shown in the literature. Although not exempt from difficulties, the cervical laminoplasty seems to present less global rate of complications that the conventional laminectomy in diverse prospective studies.25, 26, 27 It has been observed that the incidence of neurological deterioration due to postoperative hematoma is less probable in the laminoplasty (0.44%) 34 against the laminectomy with posterior instrumentation (1.25%)35 due to the natural protection that the laminas provide. In contrast, no statistically significant differences have been found between both techniques regarding wound complications (laminectomy 3.83%; laminoplasty 1.57%), the incidence of kyphosis (laminectomy 6.34%; laminoplasty 4.44%) or paresia of the C5 root (laminectomy 5.11%; laminoplasty 7.64%).36 In addition, in terms of the postoperative stiffness and cervical pain shown by some patients, aspects that are indirectly correlated with the resulting range of movements after the surgical intervention, diverse series show that, although we are talking about a symptomatology that can be present after the development of both techniques due to the manipulation and dissection close to the articular facets,37 they seem to be more frequent after the carrying out of a laminectomy, especially if it is carried out using instrumentation for the fusion.26, 27 The pain normally comes on shortly after the surgery, normally related to postoperative muscular stiffness and usually, can be resolved during the first year after the intervention. 37We are aware that the long-term use of the orthosis might affect the muscle atrophy of the neck and axial pain. Nevertheless, we believe that the indication of a soft collar during the first three postoperative months (period that, within the biological process of scarring, includes the maximum repair and remodeling in the soft tissues and bone), largely alleviates the cervical muscular contracture inherent to the immediate postoperative period and, consequently, the cervicalgia, while the rehabilitation treatment posterior to the withdrawal of the orthosis, reduces the possible complaint related to the cervical stiffness to some weeks. Finally, and similarly, we believe that the use of a cervical collar for the first 12 postoperative weeks, which coincides with the phases of maximum bony consolidation in humans, contributes to giving the sufficient immobility to ensure the success of the fusion of all the implanted bony grafts and the creation of a new and stable cervical arch. Our clinical and radiological results support this protocol of action. The cervical laminoplasty is an effective technique to achieve a widening of the spinal canal sufficient in those patients with multilevel cervical medullary compression. Even though this procedure is more technically demanding than the cervical laminectomy, it does assure, among other things, a lower transgression of the posterior cervical anatomical structures of the patient. In our opinion, the modifications on the laminoplasty technique originally published by Hirabayashi that we present in this work, has many clear advantages. The use of local autologous bony structures, the spinous processes, in combination with a solid support scaffolding achieved by means of conveniently molded titanium plates allow us, on the one hand, to achieve sufficient increase of the anteroposterior diameter of the cervical canal to ensure a clinical benefit for the patient, and on the other, this creates the ideal setting for fusing the bony elements in the construction and obtaining of a new cervical arch. All of this, is achieved with minimal risks and a consequent decrease of the possible postoperative morbility. Finally, we are aware that the number of cases is still small, but our statistically significant clinical and radiological results encourage us after two years of follow-up. In this way, we think that our technique is a simple, efficacious and safe procedure, which is configured as the best surgical strategy in cases similar to those presented. We thank Javier Hernandez Vicente M.D., for his drawings and efforts in critically reviewing the manuscript. (1973) A new method of posterior descompression. Chubuseisaisi 16:792, (jpn). 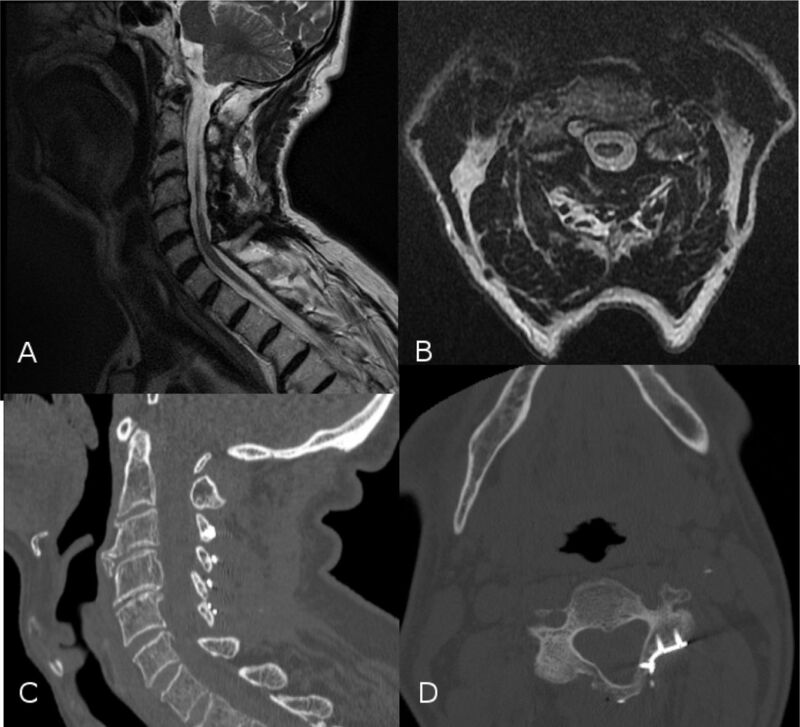 (2001) Short term complications and long term results of expansile open-door laminoplasty for cervical stenotic mielopathy. Spine J 1:26–30, 2001. (2004) Long term results of expansive opendoor laminoplasty for ossification of the posterior longitudinal ligament of the cervical spine. J. Neurosurg Spine 1:168–174. (1998) Posterior movement and enlargement of the spinal cord after cervical laminoplasty. J Bone Joint Surg Br 80:33–37. (2003) Local kyphosis reduces surgical outcomes of expansive open-door laminoplasty for cervical spondylotic myelopathy. Spine 13:1258–1262. (1999) Evaluation of cervical laminectomy and laminoplasty. Spine 24:1283–1289. (2000) A biomechanical, radiologic, and clinical comparison of outcome after multilevel laminectomy or laminoplasty in the rabbit. Spine 22:2925–2931. (2006) Cervical laminoplasty. The Spine Journal 6:274–281. (1983) Expansive open- door laminoplasty for cervical spinal stenotic myelopathy. Spine 8(7):693–699. (1984) Double door laminoplasty through longitudinal splitting of the spinous processes for cervical myelopathy. RinshoSeikeiGeka 19:483–490. (1981) Operative results and postoperative progression of ossification among patients with ossification of the posterior longitudinal ligament. Spine 6:354–364. (2005) History of standard scoring, notation, and summation of neuromuscular signs. Acurrent survey and recommendation. J Peripher Nerv Syst 10(2):158–173. (1988) Operative procedure and results of expansive open-door laminoplasty. Spine 13(7):870–875. (2001) Interobserver and intraobserver reliability of the Japanese Orthopaedic Association scoring system for evaluation of cervical compression myelopathy. Spine 26(17):1890–1895. (2008) Revision surgery for cervical spondylotic myelopathy: surgical results and outcome. Neurosurgery 63(2):292–298. (2009) Dynamic plates in anterior cervical fusion surgery: graft settling and cervical alignment. Spine 34(15):1567–1571. (1975) The Mc Gill. Pain questionnaire: major properties and scoring met-hods. Pain 1: Pain 1:277–299. (1999) Analysis of dural configuration for evaluation of posterior descompression in cervical myelopathy. Neurosurgery 44:91–96. (1997) Evaluation of prognosis factors following expansile laminoplasty for cervical spinal stenotic myelopathy. Surg Neurol 48:237–245. (1985) Operations for cervical spondylotic myelopathy. A comparison of the results of anterior and posterior procedures. J Bone Joint Surg 67(4):609–15. (2004) Open-door cervical expansile laminoplasty. Neurosurgery 54:119–124. (1999) Modified open door laminoplasty for treatment of neurological deficits in younger patients with congenital spinal stenosis: analysis of clinical and radiographic data. J Neurosurg 90:170–177. (1992) Spinous process splitting laminoplasty using hidroxyapatite spinous process spacer. Spine 17:S41–S43. (1992) Cervical laminoplasty by splitting the spinous process using AE glass-ceramic lamina spacer. Rinsho Seikeigeka 10:1115–1122, (jpn). (2013) Modified plate-only open-door laminoplasty versus laminectomu and fusion for the treatment of cervical stenotis myelopathy. Orthopedics 36(1):e79–87. (2012) A prospective, randomized trial comparing expansile cervical laminoplasty and cervical laminectomy and fusion for multilevel cervical myelopathy. Neurosurgery 70(2):264–277. (2001) Laminoplasty versus laminectomy and fusion for multilevel cervical myelopathy: an independent matched cohort analysis. Spine 26(12):1130–1336. (1996) Long-term follow-up review of suspensiónlaminotomy for cervical compression myelopathy. J Neurosurg 85:817–823. (2001) Subtotal corpectomy versus laminoplasty for multilevel cervical spondylotic myelopathy: a long term follow-up study over 10 years. Spine 26:1443–1448. (1994) Extensive simultaneous multi-segmental laminectomy and posterior descompression wit posterolateral fusion. J Jpn Spine Res Soc 5:167. (2014) Comparative effectiveness of open-door laminoplasty vs French door laminoplasty in cervical comprressive myelopathy. Spine 39:642–647. (2009) Descompressivelaminoplasty in multisegmental cervical spodylotic myelopathy: bilateral cutting versus open-door technique. Acta Neurochir 151:739–749. (2012) Longterm outcomes of 2 cervical laminoplasty methods: midline splitting versus unilateral single door. J Spinal Disord Tech 25:224–229. (2011) Incidence of postoperative symptomatic epidural hematoma in spinal descompression surgery. J Neurosurg Spine 15:202–205. (2015) Preoperative risks associated with cervical spondylotic myelopathy based on surgical treatment strategies. Int J Spine Surg 19:9–24. (2013) Laminoplasty versus laminectomy for multilevel cervical spondylotic myelopathy: a systematic review of the literature. J Orthopaedic Surgery and Research 8:45. (2005) in The cervical spine, Laminoplasty, ed Clark CR (Lippincot Williams and Wilkins, Philadelphia), pp 1057–1071.